For the second straight week Cal goes into a game not knowing the status of its opponent’s best player. It didn’t work out so well for the Bears last week, and it might be more of the same this time. Last Wednesday, Washington State’s Robert Franks, the leading scorer in the Pac-12, was not cleared to play until just before tip-off after he missed the previous four games with an injury. He played, scored 24 points and led the Cougars to an 82-59 victory. 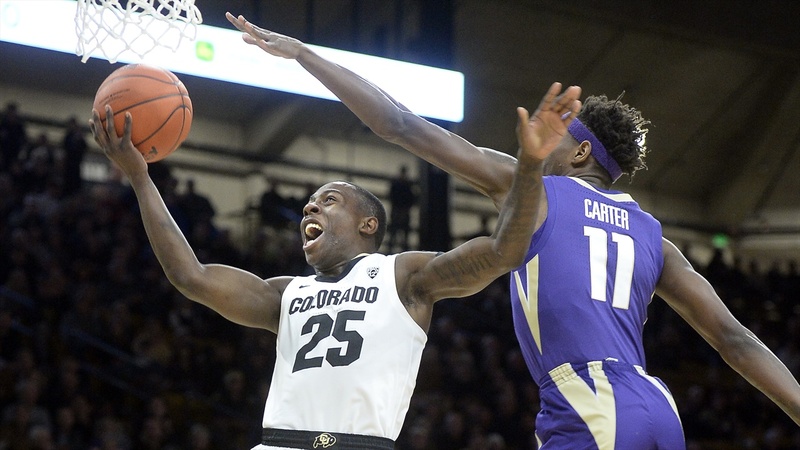 This week it’s Colorado’s point guard McKinley Wright (25, above), who leads the struggling team in scoring (12.9 ppg) and assists (5.25 per game). He left the game against Washington on Jan. 12 with a shoulder injury and missed the Buffs’ loss to Utah on Sunday. But the latest word from Boulder is that Wright is expected to play Thursday night when Colorado comes to Haas Pavilion. "(He's) coming along well," head coach Tad Boyle told the media after Tuesday's practice. "He's a little out of shape, yesterday he was huffing and puffing, but he had a good crisp workout yesterday. Today he's better, playing with the brace. I think he's adjusting to that. I think he'll be in the lineup and be good. Don't know that for sure yet, but we'll take it day by day, but he did practice today and he looked good." Not that the Buffs (10-7, 1-4 Pac-12) were doing all that well with him. They began the year 8-1 against a less than daunting schedule, but have gone 2-6 since, with the only thing keeping them above the Bears in the standings is their home victory over Washington State. Injuries and other roster depletions have played a part. Wright’s isn’t the only one the Buffs have sustained. Seven-foot center Dallas Walton was lost for the season before it began with a torn ACL. Guard Namon Wright, a reliable sixth man, missed three games with an injury. He was healthy for Utah, but contributed little. Fellow guard Deleon Brown is academically ineligible. In Wright’s absence JC transfer Shane Gatling took over the point and led the Buffs in scoring against Utah with 21 points. He wasn’t bashful about shooting, hoisting up 18 attempts and hitting six, including a trio of three-pointers. Sophomore Tyler Bey, who’s averaging 9.1 rebounds to lead the Buffs is 32nd nationally in defensive rebounds per game (7.0) and 78th in total rebounds (154). He is also 86th nationally and fifth in the Pac-12 for double-doubles. He’s averaging 11.4 points per game. Colorado has won two straight against Cal, but both those wins were in Boulder. The Buffs have lost four straight in Berkeley. And while Cal’s recent trend has been starting fast then fading, Colorado has had the opposite problem, something that plagued the Bears earlier in the year. The Buffs have been getting out of the gate slowly, falling in a deep hole. Against Arizona State, Washington and last week Utah, Colorado was behind early. He said he may adjust his starting lineup and getting Wright back would be a step in the right direction. Jomes said that becasue Colorado does not have a dominant center and they are a little undersized as are the Bears, and he likes the matchuip. Following Colorado, Utah comes to Haas on Saturday evening. The game time, originally 7 p.m. has been switched to 5 p.m. The Utes (9-8, 3-2) are in a four-way tie for fourth in the conference with USC, UCLA, and Oregon State. Arizona State (4-2) and Arizona (5-1) are within reach. Utah has the best chance to move up as it is playing the Bay Area schools (Stanford on Thursday night) while the LA and Arizona schools play one another. Head coach Larry Krystkowiak said the three areas the Utes have been concentrating on lately have been transition defense, guarding the basketball and not allowing opponents second shots. “We’ve done much better and our numbers have improved dramatically,” he said this week. Like Cal, Utah is a young team. Two freshmen started against Colorado, while two others are in the roation freshmen. Freshman forward Tim Allen has emerged as one of the top forwards in the conference. He had his first career double-double (21 points, ten rebounds) and has scored in double figures three of the last four game. The Utes also have had at least three double-figures scorers in each of their nine wins. They have lost seven straight and are the only Pac-12 team without a conference win. “Practice has been going well,” Jones said Tuesday, then noted with a slight chuckle, “practice always seems to go well. Jones said the team’s youth is a factor in the Bears’ inability to hold a lead. “And it comes down to being able to limit our wasted possessions. …..I’m telling the guys when we get into the part of the game when we can kind of see it coming we can not get sped up. We have a young team, and the biggest difference between a young team and a veteran team is that the young team allows the veteran team to speed them up. Roman Davis made his first start of the season at Washington on Saturday. “The decision to start Roman on Saturday was that he was the only one who really fought on Thursday,” Jones said. He said he was particularly pleased with Davis’ rebounding, whether he got the ball or not. “He had one where he got a foul on a box out but I like the fact that he had the toughness and the energy and effort and willingness to do that.. We need more of that,” Jones said. “We need more fight. We need more messages sent to the other team that you’re not going to push us around. The 1959 team, which won the NCAA championship, will be honored at halftime on the 60th anniversary of the achievement.